One of my favorite sites that monitors Black Friday deals has already gotten ahold of the ads for Toys R Us, Kmart, Harbor Freight, and Walmart. 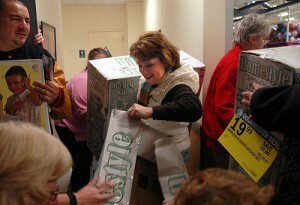 (Black Friday is that day after Thanksgiving when retailers jump start holiday shopping by offering BIG deals.) Right now the focus is on toys. No electronics or clothing ads yet. Go directly to a scanned copy of each Black Friday ad here, or click below for a list of each store’s deals. While there are a couple good deals to be found, the majority of the items are on sale for their normal retail price; some are even “on sale” for more than their current price. I’m guessing stores wised up to early demand for Black Friday deals by releasing ads that are far from final. One deal that is worth noting is a coupon for a $10 Toys R Us gift card when you spend $75. Not sure if you want to brave the mall on Black Friday? Watch this video to figure out the best way to shop.